Boulder Dash is one of those games that, for my entire life, has somehow eluded me (or is it evaded? It's probably neither). For unknown reasons, it's a game that I've never played despite it being released numerous times on numerous systems. So, I've decided that now is as good as time as any to dig it out (ho-ho!) and give it a go. The closest I've probably come to playing anything like Boulder Dash was a game called Rubble Trouble on my Acorn Electron. I say probably as, although I've had the game since the late 1980s, I've never managed to get it to work. I must have spent literally hours of my life staring at the "Bad Program, Rewind Tape," error message in the hope that I could just get past the bit on the tape that was causing the problem. For all I know, Rubble Trouble is nothing like Boulder Dash. If you like the colour brown, you'll love this. Every now and again, the path will have this weird pattern in it. I don't have any idea why. More fun with rocks and diamonds. The aim of Boulder Dash is quite simple. You control Rockford who must collect diamonds hidden in caves. To get to the diamonds, you must clear a path. Littered around each cave are also boulders, and clearing a path below them will cause them to fall into it. Clear too much ground and you'll have a boulder avalanche on your hands. If any falling rocks, or even diamonds, come into contact with Rockford, he dies. Also populating each cave are what are apparently fireflies and butterflies and a strange green ooze. The fireflies and butterflies are lethal on contact, but butterflies produce diamonds when destroyed which is essential for completing some levels. The fireflies simply leave a 9x9 space when destroyed. The ooze will become diamonds if it gets prevented from growing any larger, again necessary for level completion. It'll become a load of boulders if it gets too large. 9 diamonds all for me!!! To look at, Boulder Dash is nothing amazing. As a game from 1984, its graphics are quite primitive and aren't attractive, but seeing as they are meant to depict rocks and dirt, they actually fit the context of the game quite well. The colour palette changes for each level which ensures that you sense that there is a transition from one level to the next and gives each level its own feel. As for sounds, the title music is quite unique, not memorable in the slightest, but again seems to fit the game. There is no in-game music, although having now played versions that do have music during gameplay, I prefer it without. Rockford sounds like he's sniffing his way through the levels, rather than digging the dirt out of the way, although the falling rocks have a satisfying rumble and crunch to them, and falling diamonds have a nice tinkling effect as they fall. Like the graphics, the sounds aren't amazing, and don't demonstrate any of the funky effects that the Commodore 64's fabled SID chip was capable of, but they really do fit the game. Looking at this screenshot, you wouldn't have a clue what you need to do. Those square things next to the diamonds are fireflies. Oh yes. It's in the gameplay that Boulder Dash shines. The game is instantly playable but quickly becomes challenging. You need to combine skill and strategy to complete each level safely but within the tight time limits. The game is perfectly balanced in this respect. You can't tackle each level like a bull in a china shop, but you can't take too much time making up your mind where you want to go next. It's all about knowing when to pause for thought to plan your route and when to take a risk and plough through the dirt. Death never feels unfair as it is always caused by your own actions. Each enemy has their own attack pattern, and it doesn't take long to understand how to avoid them, and also how to use them for your own advantage. The movement of the ooze and slime is also quite random, meaning that you will have to rely on reflex skills to tackle them, rather than remembering how you've played the levels before. And although the concept of the game remains constant throughout, each level feels very different and throws a new kind of challenge at you. On the Commodore 64, the levels scroll smoothly and Rockford moves responsively, which all contribute to making the game extremely playable. For a relatively early game, Boulder Dash packs a great variety of gameplay elements into it. It's a great combination of a puzzle game and an arcade style game and everything in it just feels right. I think what makes the game quite appealing, and could be quite an interesting topic of research, is the whole idea of being able to be destructive, but at the same time to collect as many diamonds as possible. Quite often, not all the diamonds are required to complete a level, but I think it could be quite interesting to see if an element of greed might encourage people to attempt to get them anyway. It's no wonder that the game is still regularly rereleased today, and it makes me wonder why it's taken me so long to discover it. 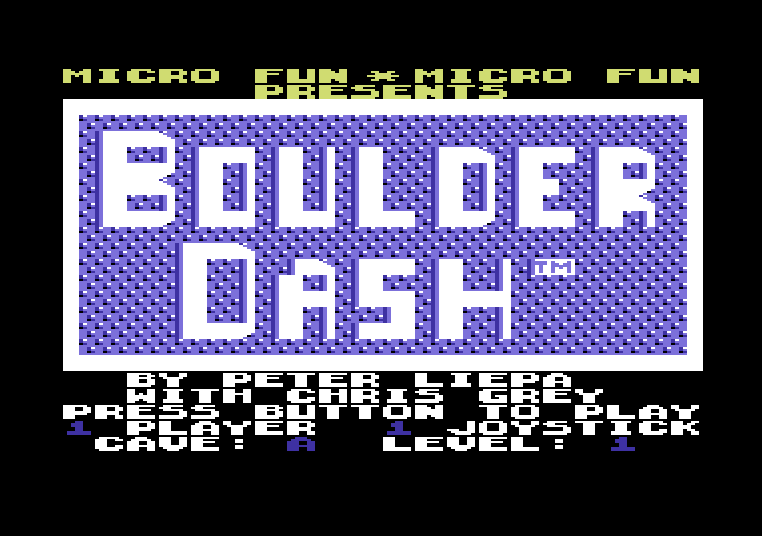 *Apparently, Boulder Dash first came out on the Atari 800. However, as that computer was pretty much non-existent here in the UK, I've decided to ignore this fact. 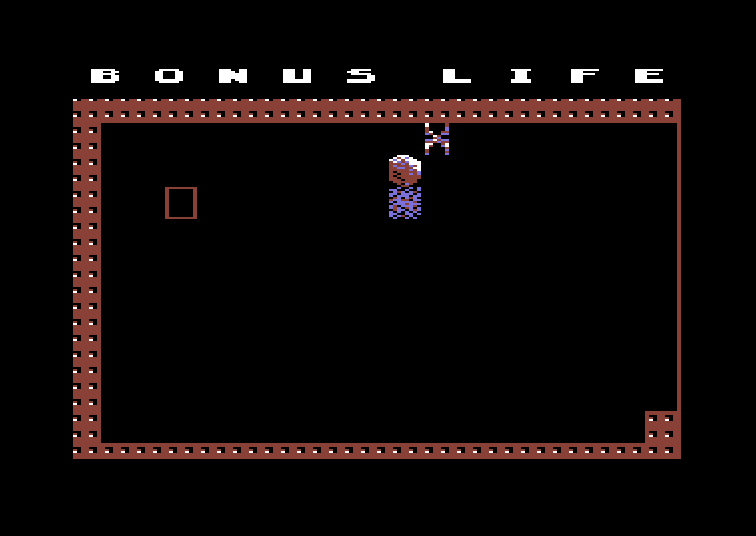 **The C64 version of Boulder Dash that was available on the Wii through the Virtual Console service has since been removed, along with all of the other C64 games. I would update the article itself, but it seemed like too much effort, so I thought I'd mention it here instead. Not the most attractive of title screens, and very little in the way of presentation at all. It's going to be a challenge to make the graphics attractive when the game is about somebody digging through a world of boulders, and it turns out that they aren't amazing. But they're not bad either. A tune, if you can call it that, plays over the title screen while suitable sound effects make themselves heard during gameplay. The game is instantly playable and rewards a variety of gaming styles. It controls well, is fast-paced and offers a tough, but fair, challenge. Fantastically fun, with plenty of variety in each of the 16 levels. A enjoyable game to master. Where to begin? It'd be easier to list hardware that it wasn't released on. Complicating matters is that some of the releases are modernised remakes of the original. Oh well, here we go. Boulder Dash was first released for the Atari 800. It also appeared on the Acorn Electron, Amstrad CPC, Android, Apple II, Arcade, Atari ST, BBC Micro, Blackberry, Colecovision, Commodore Amiga, iOS, Nintendo 3DS, Nintendo DS, Nintendo Game Boy, Nintendo Game Boy Advance, Nintendo Virtual Console, Mac, MSX, PC, PMD 85, Sony PSP, Xbox 360, ZX Spectrum. More recently versions have been released for the Atari 2600 and Intellivision. Boulder Dash:30th Anniversary is available on Android, iOS, PC and Mac. Boulder Dash XL 3D is available for the Nintendo 3DS. Although most later releases of Boulder Dash were quite often remakes based on the concept of the original game, there were a couple of actual sequels. Boulder Dash II was released in 1985 on a small number of home computers, Boulder Dash III appeared in 1986 on the Apple II, Commodore 64, ZX Spectrum and PC. Both of these games had alternative names when released for different machines and in different regions. Boulder Dash Construction Kit (Boulder Dash IV for a Speccy rerelease) also appeared in 1986, and in 1990 there was Boulder Dash Part 2 in the arcade.